To find out the application procedure to follow if you hold a French or a foreign degree, and depending on the program level you want to apply for, please fill in the form below (please note that applications open from November for Eiffel scholarship applicants only and from January for other foreign degree applicants). Please read carefully the Frequently Ask Questions section, and check the deadlines before applying. 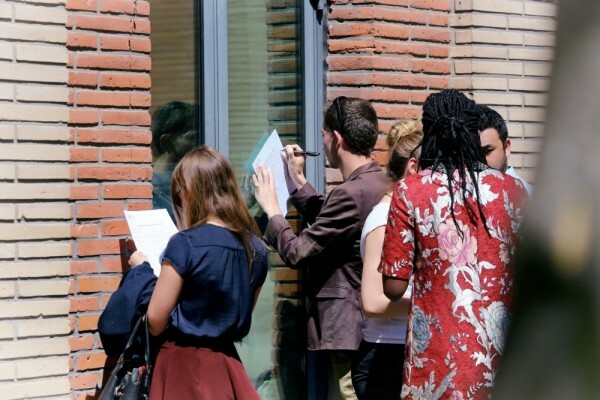 May 2nd to 22nd 2019 : applications for Bachelor's degrees 2nd and 3rd year (applicants holding a French or a foreign degree) and Master's degrees (applicants with a French degree). Any application submitted outside of the recruitment campaigns will not be reviewed. A Welcome pack called ALL IN-TSE to help you to settle in Toulouse. As for the academic year 2018-2019, the Student Social Security contribution (217 euros) disappear. It is replaced by a student life contribution, the "Contribution Vie Etudiante" (CVEC), amounting to 90 euros, which must be paid to the CROUS, before the administrative registration. Fee waiver recipients: In 2017-2018, 6 students received a fee waiver of 5,500 euros out of 6,000 euros based on academic and geographical criteria. This action is part of TSE policy and will be maintained for next recruitment campaigns. Please note that these fee waivers are part of the International Master program application process. Applicants who received an admission proposal in a Master program must submit a cover letter requesting a tuition fee waiver and send it to tse-studentsrecruitment@ut-capitole.fr. The fee waiver commission will be held on mid-June 2019. You will be informed of the decision by email by the Admissions office. Please note that a fee waiver only concerns Master tuition fees and you will have to pay the remaining registration fees re-evaluated each year (243 euros for 2018/2019) and the CVEC ("Student life tax") amounting to 90 euros. Sanofi and Analysis Group offer a scholarship grant that will be awarded to one U.S. resident for his/her first and second Master’s years (2019 – 2021) at TSE. Application process : The application to the grant is conditional on your admission into the 1st year of the Master’s program (please see deadlines in the dedicated section). After completing his/her application for admission to a TSE Master’s program, the applicant should send his/her grant application file by email to the following address – dean.office-tse@ut-capitole.fr (before March 1, 2019). Download the PDF document for eligibility requirements. Candidates who wish to be supported for the Eiffel scholarship will have to apply in November through our procedure (see Deadlines). This scholarship (also from the French Ministry of Foreign Affairs) is awarded through the French Embassies channel (750 euros per month for 9 to 12 months). Deadlines to apply: February to April. For more information, visit the website of the French Embassy in your country. Regular students at Toulouse School of Economics which is part of Université Toulouse 1 Capitole (Federal school code: 04266200 for deferment only ) are eligible for the purpose of granting to an inschool deferment of repayment of Federal Family Education Program Loans and Federal Direct Student Loans. Some TSE grants can be allocated to M2 students “Doctoral track” (between 8,000 euros and 12,000 euros). Please note that the allocation of grants is part of the application process for the Doctoral Program. To apply, you must send an email to the Doctoral School once you have received your admission confirmation for M2 ETE (contact: phd.tse@ut-capitole.fr). Please attach a covering letter with the email, explaining your personal and academic background. The selection committee at the Doctoral School will meet in April or early May to review the applications and attribute TSE grants to the best candidates. L’association Jean-Jacques Laffont allocates each year one or several grants to a student originating from a developing country, and assigned according to merit (between 5000€ and 8000€). Students that have been successfully accepted for an international Master’s at Toulouse School of Economics, and receives a grant from the Jean-Jacques Laffont association, to the extent of 2 students per year, will be exempt of course fees for this Master. Research scholarships from the French Ministry of High Education and Research are granted to the best students coming out of the first year (Master 2 research). Beneficiaries must be 30 years or less at the time the scholarship is awarded (1,300 euros per month, for three years). Exceptionally, outstanding students not eligible for these scholarships can be offered equivalent fellowships by the TSE Program. For Master program applicants holding a foreign degree: the Graduate Record Examination (GRE). No minimum is required. These letters must be sent directly by your academic referees - see FAQ.